When I really get excited to begin a new quilt I put every bit of myself into it. Often times it’s a piece of fabric that I absolutely have to sew or a pattern I really want to try. When it comes to creativity, most of us probably rely a lot on our sense of sight and the ability to clearly see our progress. Our vision is an amazingly inspirational component to our creative nature. So much of what we see defines what we think. But, following your heart is based more on emotionally driven inspiration than just doing the same old thing you usually do. This is when it’s time for a family memory quilt. There are so many different ideas to try. I particularly like to print photos onto fabric and use them in quilts. With the right color placement, a rail fence block makes a great autograph pillow. I made one for a friend who was moving away and it provided a perfect place for everyone to write a farewell message. It was a beautiful keepsake to bring to a new home. For me, a heartfelt project is particularly special because it conveys such a strong message. When our nephew sadly passed away a few years ago, he left his wife and young son behind. Fortunately, they were able to spend an incredible week together as a family away from doctors and hospitals to simply enjoy each other. When I saw their pictures, I knew immediately I had to make a special keepsake. 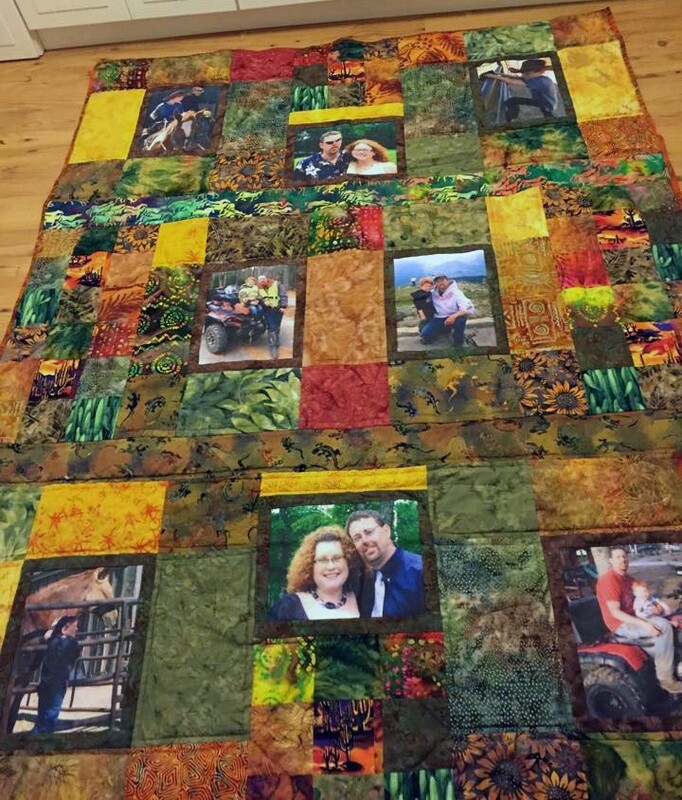 After printing the photos onto fabric, I created a Family Memory Quilt. Our great-nephew and his mother now have a reminder of the wonderful times they enjoyed together as a family. Following your heart will definitely take you where you most want to be. It also may take you on an unexpected sentimental journey. Either way, you will find inspiration when you follow your heart. 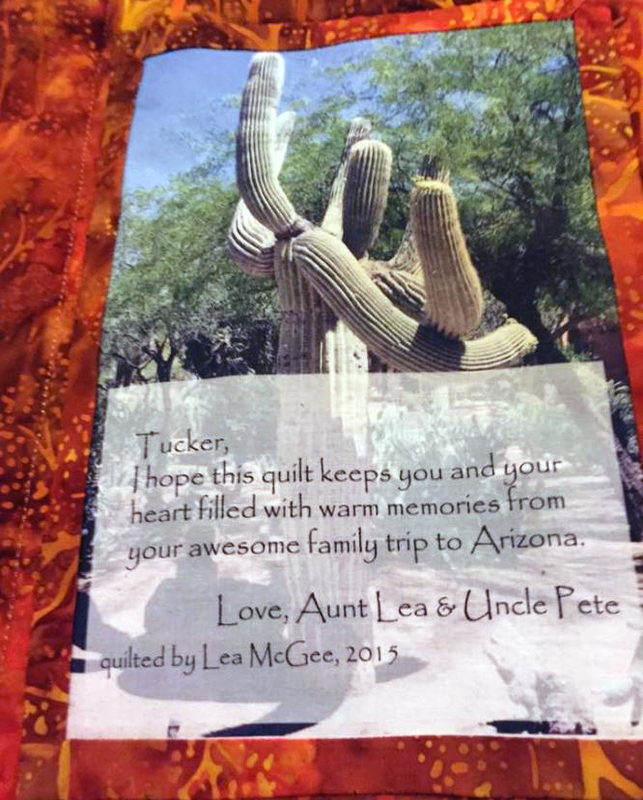 While making and gifting memory quilts is a great way to commemorate somebody or an event, don’t forget the most important thing…your label. It’s the perfect opportunity for you to express the significance of your quilt to the recipient. Including a personal message that can be frequently re-read emphasises how meaningful the quilt is. This is the label I added to Tucker’s quilt. I photoshopped it to include text over the photo. By simply adding a color-filled shape on top of the photo, the words are easily read. Now, whenever this quilt is used there’s a special message as a reminder of its intent. Gifts personalized with photographs are always cherished. They bring smiles and conjure old memories. Photographs may be used to commemorate a milestone event like first steps or the first day of school. An oversized pillow emblazoned with familiar faces enjoying time spent together will be held close forever. Or it can become a collection of autographs for a farewell gift. Get creative and personalize your quilted gifts to become forever keepsakes. My favorite printable fabric is Printed Treasures Inkjet Printable Fabric . It’s a sheet of cotton fabric that is stabilized to feed through inkjet printers. It’s easy to use in the printer and sews great. I’ve used it for dozens of quilts and have had great success every time. Be sure to use an inkjet printer or you won’t get a good quality, long-lasting photo to work with. The ink is printed directly onto the fabric and sets quickly. The instructions on the package are very self explanatory. I’ve used these printable fabric sheets for years and have had great luck. I prefer this product over the iron-on sheets because I found those don’t hold up very long. I have a number of pillows with blank centers where the ironed on photo disappeared in the wash. Here are two tips I strongly recommend. First, when you prepare your photo to be printed, darken it a good 20% – 25% before printing. This will give you more ink saturation and a stronger image. Secondly, be sure to heat set the photo once the ink dries by pressing the back of the photo with your iron. Then let it cool. This will give more permancy to the ink. Below are more projects using printable fabric for memory quilt photos. 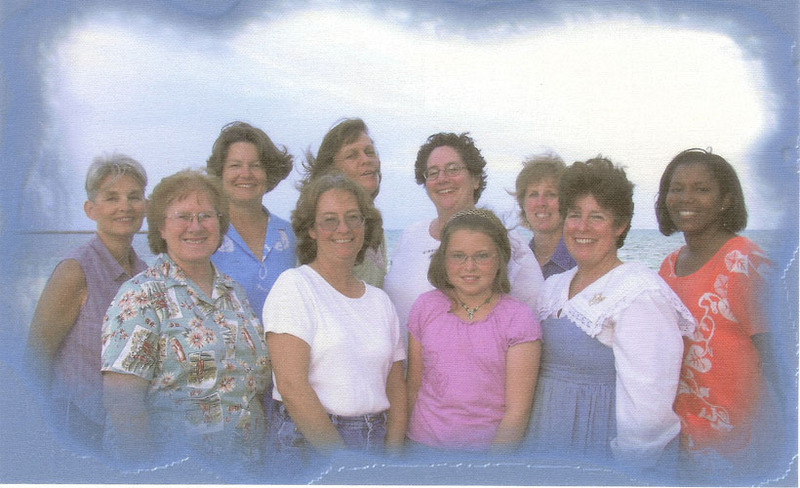 These are members of my Island Quilting Group I belonged to for many years. This photo printed on fabric was used for both going away quilts and pillows. Each member made a block for the quilt top, and they were placed around the center block of this printed photo on fabric. 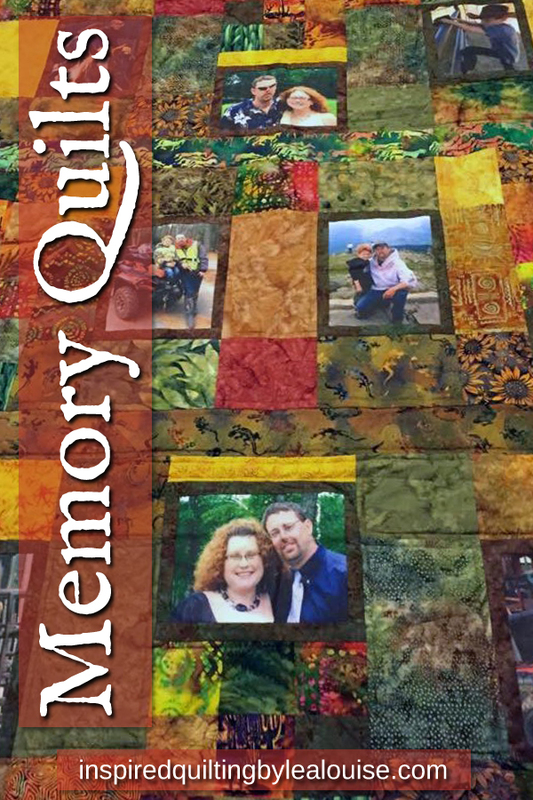 It was a fabulous keepsake for departing quilters to always remember the creativity and friendship shared through quilting. Looking at this photo today brings back memories of weekends spent quilting and sharing potluck dinners together. Yes, there was also a lot of quilting accomplished, too! This quilt was a farewell gift for a departing school principal. The class picture is printed on a fabric sheet and placed in the quilt center. It is surrounded by blocks with each child’s handprint and name. 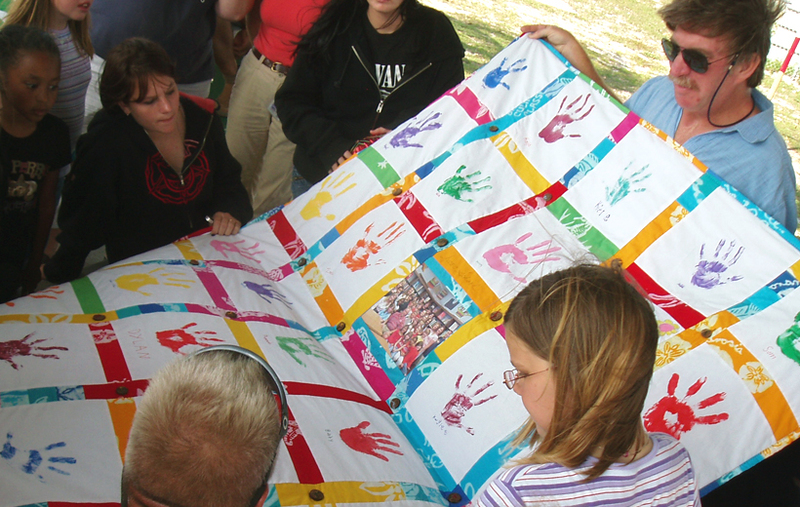 The kids loved being involved in making this special quilt and enjoyed being part of a lasting keepsake. It was a big hit!